There are total 28 domino cards on each round of the game (each player get 4 cards). Each card has upper and lower side is divided with the line center. Each card has different dot count, each dot indicates the value of the card. The easiest way to remember all the cards is to group them into 7 series of card type. The orange number at the bottom of the card indicates the dots count for each card. - 0(zero) dot series: 7 cards in total. Each card has empty dots part on the upper or lower side, 1 (one) dot series: 6 cards total, each card has one big dot part on the upper or lower side. - 1 (one) dot series: 6 cards in total. Each card has one big dog part on the upper or lower side. - 2 (two) dot series: 5 cards in total. Each card has two dot parts on the upper or lower side. - 3 (three) dot series: 4 cards in total. Each card has three dot part on the upper or lower side. - 4 (four) dot series: 3 cards in total. Each card has four dot part on the upper or lower side. - 5 (fIve) dot series: 2 cards in total. Each card has five dot part on the upper or lower sde. - 6 (six) dot series: 1 card in total. Each card has six dot part on the upper or lower side. Counting the card in this game is on per 2 card basis, just count the tota dots on each card on the left and sum it with the total dots on the right side. + Rule 1: If the total dots of two cards is more than 9, the value is minus by 10. + Rule 2: If the total dots of two cards is more than 19, the value is minus by 20. 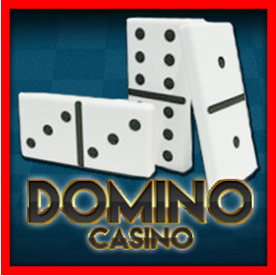 Each player get 4 of domino card, which is divided into 2 section: the "Left Side" and the "Right Side". _ You don't have to count dots of the card while playing in the game, the left side value and the right side value will display automacally on the game. _ Remember that the left side value must be bigger than or same as the right side value or you have to switch position of the cards. In 99 Domino 4 card games has 5 special mixed cards beside normal card value. Each special mixed card has different pay for each win. Special Card win are multiplied by ANTE bet. Double 9: Total value of two cards on the left and the right side is 9, so you get 99 cards, the highest value in normal cards. Other player may have same value 99 cards, if so the winner is split. Big Series: Fourth place in special cards. If you have total dots between 38 and 43 then you have a big card, no other player will have same big cards, you will win the game, except other plyer had 6666, TWIN or SMALL cards. Small Series: Third place in special cards. If you have total dots between 6 and 9 then you have a small card, no other player will have same small cards, you will win the game, except other player had 6666 or TWIN cards. Continuous Twin Series: Second place in special cards. If you have four of these cards in a sequence, no other player will have the same twin cards, you will win the game, except other player had 6666 cards. Six Devil (666 6): The highest in special cards. If you have these cards, you win the game exactly, no other player will have cards like this."